Film fragment – DATA, 2010, courtesy At Work Collective. At Work is an artistic collective that coordinates self-declared residencies undertaken by artists at their place of work. The platform was established in the mid-2000s in Quebec, but its reach was international. The group’s manifesto was answered by dozens of artists employing occupational realism, who in a spirit of double ontology (see: 1:1 scale) practised their occupation as a form of performance. Grass-roots residencies were organized at reception desks, in the back of fast-food restaurants, at hair salons, and in the trucks of companies shipping works of art. All this happened without the knowledge or approval of management, instead artistic competence was used to introduce imagination into the monotony of repetitive tasks – the At Work collective made an art out of avoiding work. 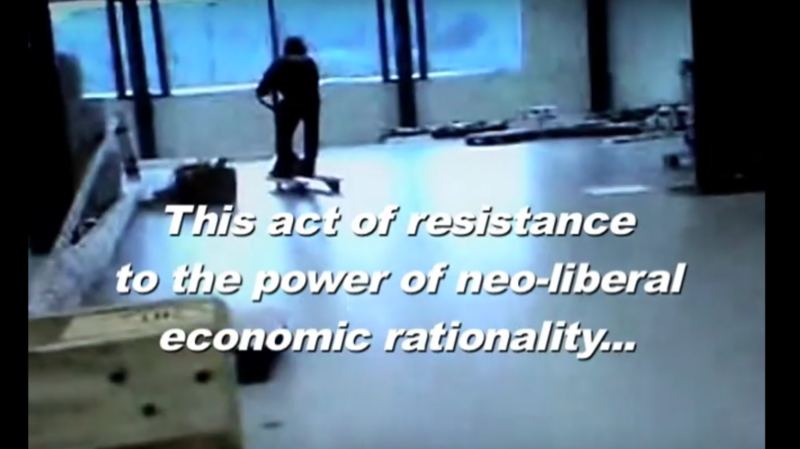 With anarchistic zest, the project brought about the synthesis of two artistic philosophies typically regarded as opposed to one another: it continued the avant-garde criticism of gainful employment as spiritual destitution (characteristic of Dadaists, Surrealists, and Situationists, with their motto “Never Work”); conversely, it alluded to avant-garde factions who tried to introduce art into the workplace (such as the Russian Constructivists or Britain’s Artist Placement Group). At Work’s only trace of the subversive activities are ephemeral reports, often taking the form of narration, photographs, or films following the YouTube aesthetic, one of which is on view in the exhibition. The report presented in exhibition consists of the film work DATA (2010), licensed by the Museum of Modern Art in Warsaw for the duration of exhibition. Courtesy At Work Collective.